The successful dance concept Don’t Let Daddy Know has championed Tiëstoas the headliner during their annual edition in Amsterdam. Ziggo Dome will host the momentous occasion for the 6th year running. On March 1st & 2nd, the biggest dance acts of today will take over the venue for a massive weekender. Amsterdam is traditionally the kick-off city of the world tour of Don’t Let Daddy Know, one of the most acclaimed dance concepts of The Netherlands. Especially for this show Tiësto will give an exclusive and one-off performance in Holland in 2019. In addition to Tiësto, Don Diablo, Coone, Headhunterz,Nicky Romero, Timmy Trumpet, Dimitri Vangelis & Wyman, Sem Vox and Third Party amongst others, will also perform in the Dutch capital. After Amsterdam, the concept continues to travel around the world and will host events in Myanmar, Chile, Spain, Romania, Thailand, Germany andEngland. Don’t Let Daddy Know is the brainchild of E&A Events, known for events such as Kingsland Festival, Martin Garrix ADE and TIKTAK Events. 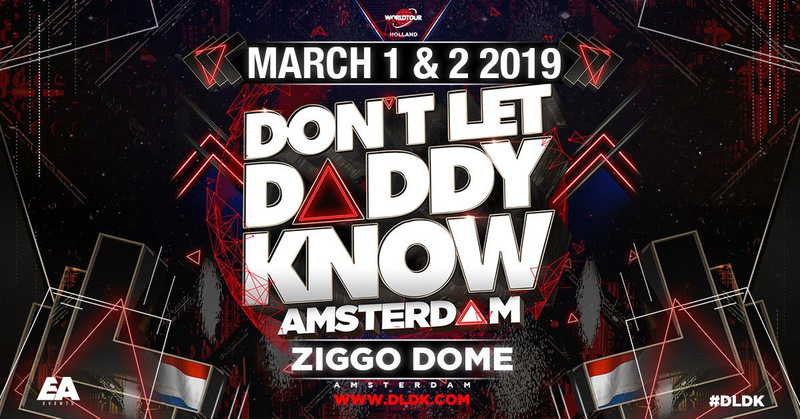 This year Don’t Let Daddy Know will be organized on Friday the 1st and Saturday the 2nd of March in the Ziggo Dome Amsterdam.